This manual contains instructions needed to configure the required fields for Work Order Plus. However, this manual only focuses on WO+ and some existing BOMP tables, like Feature Option and Job Code, will be skipped. The BOMP Global Setup and BOMP Setup will be skipped as well. You can refer to the released BM Manual for more information. There are three essential elements that are required by WO+; new G/L Accounts for configuration throughout WO+, the Labor Grade file and the Work Center file. We highly recommend making an entry in all the tables in WO+, but it is not necessary to configure everything. For example, a company can use a Base Order to maintain routings instead of Production Routing. Read through this manual and evaluate the need of your company or consult with Netcellent for more information. To absorb labor cost during the production. Each work center has its own labor absorb account, therefore it is possible to have multiple labor absorb accounts. To absorb burden cost during the production. Each work center has its own burden absorb account as well. Before the parent item is complete the production cost will be distributed to a temporary account, the Work-In-Process (WIP) Account. The labor cost, burden cost and cost difference between parent item and components for a disassembly order. Any amount remaining in the WIP account when closing an order by reporting a complete quantity of zero in the last step will be distributed to the WIP Variance Amount. The difference between standard unit cost of a parent item and actual cost once the production is complete will go to the Standard Cost Variance Account. Make sure this account exists if your Inventory Cost Method is Standard Cost. To absorb cost of outside processes. If routings have an outside process, make sure this absorb account exists. 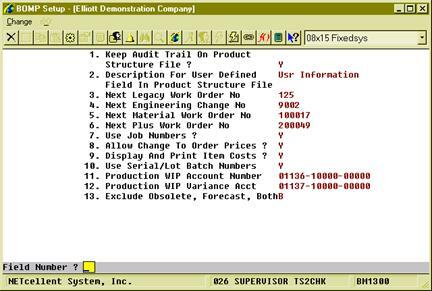 Currently Elliott contains only one Outside Process Absorb Account, located in BOMP global setup. WO+ can separate the cost amount in scrapped pieces during the production from the Finished Goods account into a scrap account. This amount is calculated based on several assumptions when the order is closed. If this feature is enabled, make sure this account exists. The following figure shows the relationship between each account. Before parent items are finished each production transaction will create distributions which credit the components’ inventory account, the labor absorb account, the burden absorbed account and the outside process absorb account, as well as distributions which debit the Work-In-Process account. When the parent items are finished the production transactions will create distributions which credit the Work-In-Process account as well as distributions which debit the parent item’s inventory account. Distributions to the variance accounts may occur as well. This will be the literal of the user defined field in Product Structure Maintenance. The user defined field will not be available if this field is blank. This is a sequence number for the next plus work order. Although Legacy, Material and Plus Work Order can use the same work order number, this allows you to define a different range for each type which can help differentiate one from another if more than one type of work order is in use. 9. Display And Print Item Cost ? Set this flag to “N” to hide all cost information, including item cost and labor rate, from all reports and screens. Work In Process Account used for Legacy and Plus work orders. Work In Process Variance Account used for Legacy and Plus work orders.